If you’ve been following the blog lately, you’ve seen I have a home preschool theme going on. Within that theme, I’m also talking about homeschooling in small spaces (because very few of us actually have entire rooms we can dedicate to homeschooling!) These Nature Tables are fantastic to use as a rotating display and can be done in the smallest of spaces! Nature tables have stolen my heart because they are simple, beautiful, inviting, and open ended. 1. Natural Beach Living set up a beautiful botany table to explore and talk bout the parts of plant. 2. I love how Hurray IC Included two corkbords to pin up nature finds! 3. The Imagination Tree has so many natural materials to explore at her nature table! It also includes a magnifying glass and branch pencils to record observations! 5. 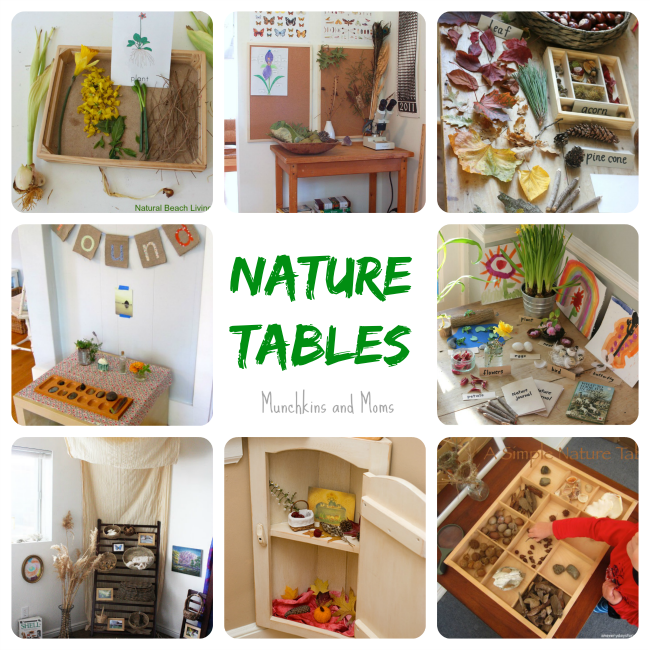 Imagination Tree updates her nature tables based on seasons. This Spring table look very inviting! 6. Still Parenting made a gorgeous nature nook (no table necessary!) using railing from n old crib! Brilliant! 7. Sew Liberated has cats that would make a typical nature table a problem. Her solution was to create a nature nook using a cabinet! Another fantastic idea to store all those treasures! 8. Wooden sorting trays make a beautiful addition to nature tables. An Everyday Story uses a tie drawer at her table. Also check out how she makes nature inspired discovery baskets for younger munchkins! Reference books like this one on Trees, Leaves, and Bark! Fandex Flashcards There are tons to choose from, but the wildflower and tree ones are especially great for traveling adventures and nature tables!